Clean, safe drinking water. Homes that aren’t overcrowded or unsafe. Communities that care for and support children and families, and that are able to carry on valued languages and traditions. The chance to get a good education and a good job, and have a say in how one’s community is governed. These are things that everyone in Canada should have, yet they are also things that, for too many Indigenous Peoples in Canada, remain out of reach. Across the country, Indigenous Peoples, non-Indigenous Canadians, and the Government are working hard to improve the quality of life of First Nations, Inuit and Métis peoples. Together, we are making steady progress—advancing reconciliation and forging a new relationship based on recognition of rights, respect, cooperation, and partnership. For example, where it took Canada more than 40 years to negotiate 40 Indigenous land and rights agreements prior to 2015, a new approach is delivering positive results for Indigenous communities. More than 75 new Recognition of Indigenous Rights and Self-Determination discussions are underway and 29 preliminary agreements have been signed. Investments in housing, early learning and child care, health, mental health and infrastructure have all helped to close the gap between Indigenous Peoples and non-Indigenous Canadians. These investments are not only the right thing to do, but they make economic sense. The National Indigenous Economic Development Board estimates that closing the economic gaps between Indigenous Peoples and the non-Indigenous population could boost Canada’s gross domestic product by 1.5 per cent each year. There is much more work to be done to advance reconciliation, and many more steps to take. Budget 2019 represents the next step in the ongoing path toward reconciliation and a better future for Indigenous Peoples—and all Canadians. The Government is working closely with Indigenous Peoples to better respond to their priorities, to better support their plans for self-government, self-determination, and their work of nation rebuilding. That’s why the Government has taken concrete measures to remove impediments to negotiating agreements that recognize Indigenous rights and address past grievances. For example, Budget 2018 announced that Indigenous participation in the negotiation of comprehensive claims would no longer be contingent on the use of loans—instead, the Government would directly support groups in these negotiations through non-repayable contributions. Budget 2018 also provided $101.5 million over five years to support Indigenous groups pursuing their own path to reconstituting their nations through a new Nation Rebuilding Program. Budget 2019 builds on these measures to further support the priorities of Indigenous communities, to chart a path forward together with all Canadians. Following 20 years of negotiations, in 2017 the Government of Canada signed a historic sectoral self-government agreement on education with 23 Anishinabek Nation First Nations. Under the agreement, participating First Nations will create the Anishinabek Education System. The agreement recognizes Anishinabek law-making powers and authorities over education on-reserve from Junior Kindergarten to Grade 12, as well as administrative control over funding for post-secondary education. This agreement will impact approximately 2,000 students on-reserve and is an important step out from under the Indian Act toward greater self-determination for participating First Nations. The Government is committed to advancing reconciliation with Indigenous Peoples and to redressing past wrongs related to Canada’s failure to discharge its legal obligations to First Nations. The specific claims process helps right past wrongs and address longstanding grievances of First Nations through a voluntary process to seek resolution of claims through negotiations, rather than through the court system. 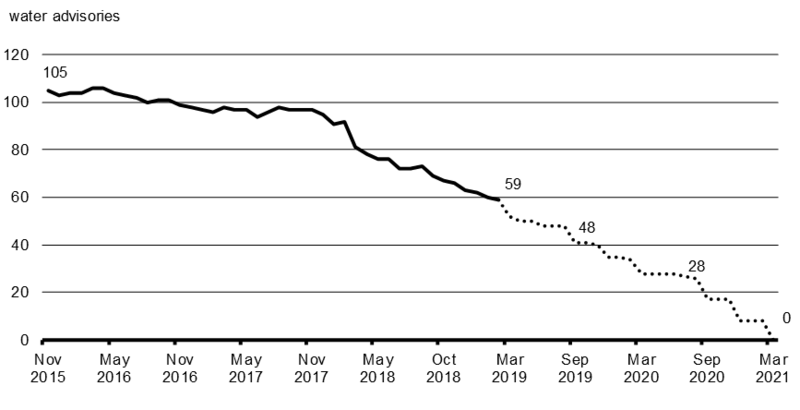 Working with First Nations, as of March 4, 2019, the Government has settled 68 specific claims since November 2015—more than a 40 per cent increase over the number of specific claims settled in the previous three and a half years (2012-2015). However, there is more work to do. The current funding to support the settlement of specific claims was to expire in March 2019. To support negotiated settlements of specific claims in a timely way, Budget 2019 proposes to renew and replenish funding for the Specific Claims Settlement Fund for a further three years, starting in 2019–20. Budget 2019 also proposes to provide additional support of $40.0 million over five years, starting in 2019–20, to First Nations to help research and develop their claims. The use of loans has been a longstanding barrier to Indigenous participation in negotiations and to concluding subsequent agreements, as debts from prolonged comprehensive claim negotiations can make it difficult for Indigenous groups to move forward with other priorities, such as economic development initiatives or service improvements. Forgiving and reimbursing loans will allow Indigenous communities and governments to use their resources to strengthen their communities and improve the quality of life of their members. Budget 2018 ended the practice of funding comprehensive claims negotiations through loans and replaced them with non-repayable contributions. To support Indigenous communities’ ability to invest in their own priorities, and to demonstrate the Government’s commitment to recognizing Indigenous rights, Budget 2019 proposes funding of $1.4 billion over seven years starting in 2018–19, to forgive all outstanding comprehensive claim negotiation loans and to reimburse Indigenous governments that have already repaid these loans. Forgiving and reimbursing loans will allow more than 200 Indigenous communities to reinvest in their priorities like governance, infrastructure and economic development that will increase health and well-being for all community members. To help support a renewed relationship with Indigenous Peoples, on August 28, 2017, the Prime Minister announced the dissolution of Indigenous and Northern Affairs Canada and creation of two new departments: Crown-Indigenous Relations and Northern Affairs Canada, and Indigenous Services Canada. Building on recommendations from the Royal Commission on Aboriginal Peoples over twenty years ago, and listening to the concerns and hopes of Indigenous Peoples conveyed during recent consultations on the creation of the two departments, Crown-Indigenous Relations and Northern Affairs Canada would be responsible for leading the Government’s forward-looking and transformative work to create a new relationship with Indigenous Peoples, focused on the recognition and implementation of Indigenous rights. Indigenous Services Canada would be the focal point for improving the quality of services delivered to First Nations, Inuit and Métis and for supporting the increased delivery of those services by Indigenous Peoples rather than the Government of Canada. Following the completion of consultations in 2018, the Government proposes to introduce legislation to effect the formal creation of these two new departments. The Government recognizes that Indigenous Peoples have an inherent right to self-government as an existing Aboriginal right under section 35 of the Constitution Act, 1982. In 2016, the Government committed to working with self-governing Indigenous communities to co-develop a new self-government fiscal policy as part of a collaborative fiscal policy development process. The Government is delivering on this commitment by working with self-governing Indigenous communities to develop evidence-based costing methodologies that will more accurately reflect these communities’ funding requirements. an interim approach to land and resource management responsibilities. All governments—including First Nations governments—need access to timely data and information. With better information, governments are better able to make informed decisions, and deliver the high-quality services their citizens expect. To ensure that First Nations have the information they need to serve their members well, Budget 2019 proposes to provide $78.9 million over seven years, starting in 2019–20, with $13.7 million per year ongoing, to permanently fund the Surveys on Indigenous Peoples and the First Nations Regional Health Survey. These surveys provide important information on education, health, employment and language proficiency—information that is needed for decision-making in First Nations communities and for designing programs and services tailored to community needs. These surveys are conducted under the leadership of the First Nations Information Governance Centre, in collaboration with Statistics Canada. In Budget 2018, the Government committed to undertaking a comprehensive and collaborative review of programs and funding that support First Nations governance. That review is currently underway. At the same time, a number of First Nations communities need additional support to build their governance capacity to effectively serve their communities. To help with this critical need, Budget 2019 proposes to provide $48.0 million over two years, starting in 2019–20, to directly support communities in greatest need obtain the expertise, advice and tools required to govern their communities and deliver critical programs and services. As of April 1, 2019, at least 70 First Nations will have their funding provided through the new 10-year grant, developed to help advance a new fiscal relationship. This funding mechanism will provide First Nations with greater certainty, greater flexibility, and reduced administrative and reporting burden. To ensure the 10-year grants grow with the needs of First Nations, Budget 2019 is proposing that starting April 1, 2020, funding for core programs and services provided through the 10-year grants will be escalated to address key cost drivers including inflation and population growth. The Government has been engaging with Indigenous groups and organizations to hear their perspectives on tax matters and the role of tax powers and tax arrangements in the new fiscal relationship. Discussions are ongoing with, among others, self-governing Indigenous governments, Indigenous groups in self-government negotiations and the Assembly of First Nations. The Government is assessing the proposals advanced by Indigenous groups and organizations to date and will continue to work collaboratively with Indigenous partners on charting the path forward. The Government also confirms its continued willingness to negotiate agreements with interested Indigenous governments to enable the implementation of First Nations Goods and Services Tax within their settlement lands or reserves, and with interested self-governing Indigenous governments to enable them to implement a personal income tax within their settlement lands. The Government also supports and encourages direct taxation arrangements between interested provinces or territories and Indigenous governments and will continue to facilitate such arrangements. The Government recognizes the important role that tax powers and tax arrangements could play in establishing a new fiscal relationship and in supporting self-sufficiency and self-determination for Indigenous governments. "It’s time for a new fiscal relationship with First Nations that gives your communities sufficient, predictable and sustained funding. This is a promise we made, and a promise we will keep." 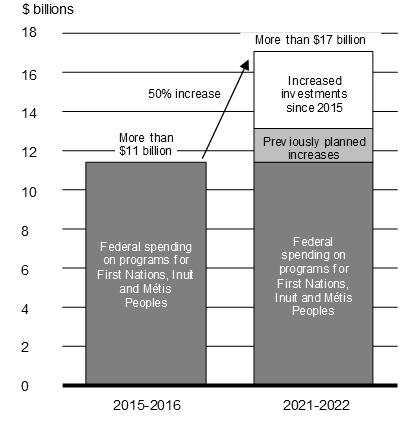 With Budgets 2016, 2017 and 2018, the Government began the important work of increasing investment in Indigenous Peoples and their priorities—starting with a commitment to establish a new fiscal relationship, and supported by total investments of more than $16.8 billion to address areas of critical need in Indigenous communities. This resulted in planned funding for First Nations, Inuit and Métis growing from just over $11.0 billion in 2015–16 to more than $15.0 billion in 2021–22—an increase of 34 per cent in total funding. 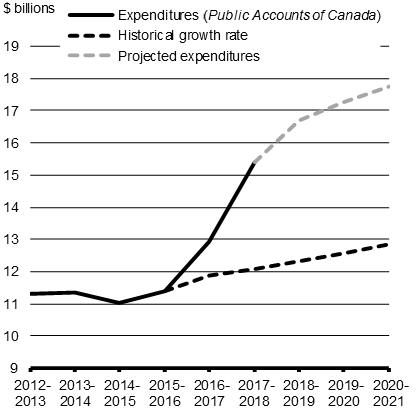 Building on these previous commitments, Budget 2019 proposes to invest a further $4.5 billion over five years, beginning in 2019–20, to continue efforts to close the gap between the living conditions of Indigenous Peoples and the non-Indigenous population, bringing total planned federal government investments in Indigenous programs to more than $17 billion in 2021–22, an increase of 50 per cent compared to the year the Government was elected. Through significant investments the Government has lifted the 2 per cent cap on funding. Note: Projected expenditures do not include 2018–19 funding for loan forgiveness. Established in 2008 as part of the Indian Residential Schools Settlement Agreement, the Truth and Reconciliation Commission of Canada gave people affected by the legacy of the Indian Residential Schools system an opportunity to share their stories and experiences, and laid the groundwork for reconciliation among former students, their families, their communities and all Canadians in a series of 94 recommendations, or Calls to Action. The Government has committed to implementing these Calls to Action and progress has been made. For example, Budget 2016 provided $2.6 billion over five years to address Call to Action 8 and end the discrepancy in education funding for First Nations children on and off reserve. In Budget 2017, the Government invested $1.705 billion over 10 years to address Call to Action 12 and develop culturally appropriate early childhood education programs for Indigenous families. In Budget 2018, the Government invested $1.4 billion over six years, starting in 2017–18, to support Call to Action 1 and help reduce the number of Indigenous children in care. Further, the Government has taken strides to work collaboratively with plaintiffs not included in the Indian Residential Schools Settlement Agreement to implement Call to Action 29, including through the successful settlement of the Anderson class action litigation (for survivors of Newfoundland Residential Schools) and the ongoing settlement process for survivors of the Sixties Scoop. Efforts are also being made to advance Call to Action 3 to support the full implementation of Jordan’s Principle, including additional funding proposed in Budget 2019 and described later in this chapter. Calls to Action 53 to 55—National Council for Reconciliation. Budget 2019 proposes to provide $126.5 million in 2020–21 to establish a National Council for Reconciliation and endow it with initial operating capital. The Council will involve all Canadians in creating a better understanding of reconciliation, and will serve as a permanent reminder of the importance of reconciliation and the Calls to Action. The Council will engage First Nations, Inuit and Métis Nation peoples, as well as non-Indigenous Canadians, in Canada’s reconciliation process, and ensure that the important work of the Truth and Reconciliation Commission continues. Calls to Action 72 to 76—Honouring Missing Residential School Children. In memory of all the children who went missing while attending residential schools, and in support of their grieving families and communities, the Government proposes to develop and maintain the National Residential School Student Death Register and to work with parties to establish and maintain an online registry of residential school cemeteries. Opportunities for commemoration will be provided, to support the healing and ongoing reconciliation for families and communities affected by residential schools. This will be done in partnership with affected families and communities, as well as the National Centre for Truth and Reconciliation, supported by a proposed investment of $33.8 million over three years, starting in 2019–20. Call to Action 50—Supporting Renewed Legal Relationships with Indigenous Peoples. Indigenous Peoples in Canada have unique laws and legal traditions. The Government recognizes the importance of revitalizing Indigenous legal systems, and the important role that Indigenous law institutes, in partnership with Indigenous communities, can play in understanding, developing and implementing Indigenous laws. To this end, Budget 2019 proposes to provide $9.1 million over three years, starting in 2019–20, to support the construction of an Indigenous Legal Lodge at the University of Victoria, a leader in this field. The Indigenous Legal Lodge will house the university’s new dual degree program in Canadian Common Law and Indigenous Legal Orders, and will serve as a foundation for debate, learning, public education and partnership on the revitalization of Indigenous laws. Budget 2019 also proposes to provide $10.0 million over five years, starting in 2019–20, in support of Indigenous law initiatives across Canada through the Justice Partnership and Innovation Program, to improve equality for Indigenous Peoples in Canada’s legal system. Call to Action 66—Indigenous Youth and Reconciliation. Indigenous youth are the future leaders of their communities and the country’s fastest growing demographic. To help ensure that the voices of First Nations, Inuit and Métis youth are heard and to support Indigenous youth reconciliation initiatives, Budget 2019 proposes to provide $15.2 million over three years, starting in 2019–20, for an Indigenous youth pilot program delivered by Canadian Roots Exchange. Canadian Roots Exchange is a non-profit organization which works to advance reconciliation by bringing together Indigenous and non-Indigenous youth to promote mutual understanding and respect. Funding will support the establishment of a distinctions-based national network of Indigenous youth, help ensure that Government of Canada policies and programs are informed by the diverse voices of Indigenous youth, and provide support to community events and gatherings for Indigenous youth and reconciliation-focused community-based Indigenous youth activities. Call to Action 80—National Day for Truth and Reconciliation. To enable communities to recognize and commemorate the legacy of residential schools on the proposed National Day for Truth and Reconciliation, and to celebrate the unique heritage, diverse cultures and outstanding contributions of First Nations, Inuit and Métis Peoples on National Indigenous Peoples Day, Budget 2019 proposes to provide $10.0 million over two years, starting in 2019–20, to support non-governmental and community organizations holding events in communities across Canada, through Canadian Heritage’s Celebration and Commemoration Program. All children in Canada deserve a real and fair chance to reach their full potential, no matter where they live. For too long, First Nations and Inuit children have faced systemic barriers that have made it difficult for them to access the services they need. The Government is working with First Nations and Inuit partners to eliminate these barriers and help give children in these communities the good education, quality health care and culturally relevant social supports they need to succeed. Together, the Government and First Nations, Inuit and Métis Nation partners co-developed Indigenous child welfare legislation, Bill C-92: An Act respecting First Nations, Inuit and Métis Children, Youth and Families, to help address the overrepresentation of Indigenous children in the child welfare system. The proposed legislation affirms the rights and authorities of Indigenous Peoples over child welfare services to create laws and policies to help keep children safe, within their families and communities. Jordan’s Principle helps ensure that all First Nations children can access the health, social and educational services they need, when they need them. In 2016, the Government took a new approach to implementing Jordan’s Principle, and respond to the Truth and Reconciliation Commissions’ Call to Action 3, aimed at reducing the gaps in services between First Nations children and other children in Canada. This included an initial investment of $382.5 million over three years, to establish the Child First Initiative. Since July 2016, more than 214,000 requests for services have been approved, giving First Nations children access to life-changing services including speech therapy, educational supports, medical equipment, mental health services, and more. To ensure that First Nations children continue to have access to the services that they need, Budget 2019 proposes to invest $1.2 billion over three years, beginning in 2019–20. During that time, the Government and First Nations will continue to work together to develop a long-term approach to improving services for First Nations children, based on Jordan’s Principle. Every child deserves access to services like health care and supports at school. However, First Nations children have not always had the same access to services as other Canadians. This is because different levels of government fund different services for First Nations children, especially those living on-reserve. This has led to disputes between governments about who should pay for which services. Jordan River Anderson from Norway House Cree Nation in Manitoba got caught in one of these payment disputes. Jordan was born in 1999 with multiple disabilities and stayed in the hospital from birth. When he was 2 years old, doctors said he could move to a special home for his medical needs. However, the federal and provincial governments could not agree on who should pay for his home-based care. Jordan stayed in the hospital until he passed away at the age of 5. In 2007, the House of Commons passed Jordan’s Principle in memory of Jordan. It was a commitment that First Nations children would get the products, services and supports they need, when they need them, and the payments would be worked out later. Jordan’s Principle will support First Nations children for generations to come. This is the legacy of Jordan River Anderson. Due to the remoteness of their home communities and the limited availability of culturally appropriate services, Inuit children face a number of unique challenges accessing health and social services. Inuit families often have to travel far from their communities to receive the services that are typically available to children in other parts of the country. In September 2018, the Government committed to work with Inuit partners to ensure that Inuit children have better access to health and social services within Inuit Nunangat. Preserving, promoting and revitalizing Indigenous languages is a critical part of recognizing Indigenous identity and strengthening Indigenous communities. To support this work, the Government is advancing Indigenous languages legislation, co-developed with Indigenous Peoples. Introduced in February 2019, Bill C-91: An Act Respecting Indigenous Languages, supports these efforts. It also responds to Calls to Action 13, 14 and 15 made by the Truth and Reconciliation Commission of Canada, and supports the implementation of the United Nations Declaration on the Rights of Indigenous Peoples. To support the implementation of the proposed Indigenous Languages Act, Budget 2019 proposes to invest $333.7 million over the next five years, starting in 2019–20, with $115.7 million per year ongoing. This investment will make possible a distinctions-based approach to Indigenous language revitalization projects, will support the creation of the proposed Office of the Commissioner of Indigenous Languages, and begin the important work of revitalizing the languages that help to affirm Indigenous identity and experiences. There are more than 70 Indigenous languages spoken by over 260,000 Indigenous peoples in Canada. 1 in 5 Indigenous peoples over the age of 65 report an Indigenous language as their mother tongue. However, only about 1 in 7 Indigenous children report being able to carry on a conversation in an Indigenous language. 1 in 10 report an Indigenous language as a mother tongue. Learning an Indigenous language at home in childhood as a primary language is a crucial element of the long-term viability of Indigenous languages. Elders in Indigenous communities will play an important role in the transmission of Indigenous languages to future generations. Children are the future speakers of Indigenous languages. Indigenous Peoples are among the youngest and fastest growing segments of the Canadian population, yet they continue to face barriers when it comes to pursuing post-secondary education and finding good, well-paying work. Budget 2019 proposes to invest $824.0 million over ten years, starting in 2019–20, and $61.8 million ongoing in support of Indigenous distinctions-based post-secondary education. For more information see Chapter 1. Everyone in Canada should have reliable access to safe, clean drinking water. Since 2015, the Government has invested nearly $2 billion to build new public water systems in First Nations communities, and repair and upgrade existing systems. Horse Lake First Nation in Alberta partnered with Indigenous Services Canada for the construction of a new water treatment plant capable of meeting all guidelines for Canadian drinking water quality. The previous water treatment plant was constructed in the 1980s and had multiple issues that resulted in it being not capable of treating source water for contamination. The community now has a water treatment plant that meets the Canadian Drinking Water Guidelines and corrects a bacteriological risk associated with the ground water source. On December 19, 2018, Weenusk First Nation, a remote community 770 kilometres northwest of Timmins, Ontario, lifted a boil water advisory that had been in place since 2006. Weenusk First Nation partnered with Indigenous Services Canada to complete the necessary upgrades and repairs to the community's water treatment plant, developed an operational action plan, and now has a certified water operator overseeing the water treatment plant. The Nation huronne-wendat in Quebec built a water connection to a new residential area in the community that provides safe, clean water and an improved quality of life for community members. Miawpukek First Nation in Newfoundland and Labrador successfully completed upgrades to the disinfection system and an expansion of its water treatment plant to lift a long-term drinking water advisory that had been in effect since September 2014. These investments are delivering tangible results. Together, the Government and First Nations continue to reduce reliance on the delivery of bottled water and make progress on eliminating long-term drinking water advisories on-reserve, with the goal of having all advisories lifted by 2021. Since November 2015, more than 80 long-term drinking water advisories have been lifted—45 more that were resolved in the previous 4 years. In communities where reliable access to safe, clean drinking water has been restored, however, a risk remains. Without sufficient resources to operate and maintain water and wastewater systems, it is possible that new drinking water advisories may be issued in future. To ensure that does not happen and to make sure that previous investments deliver lasting benefits, Budget 2019 proposes to invest an additional $739 million over five years, beginning in 2019–20, with $184.9 million per year ongoing. This investment will support ongoing efforts to eliminate and prevent long-term drinking water advisories—funding urgent repairs to vulnerable water systems, and providing water operator training and support programs, so that First Nations communities can effectively operate and maintain their public drinking water systems. Roughly 60 per cent of all Indigenous people live in urban centres. Through Urban Programming for Indigenous Peoples (UPIP), the federal government supports Indigenous social service organizations that deliver culturally enhanced programs and services to urban Indigenous residents, such as help finding a job, assistance accessing childcare and other support. However, many of the facilities where service providers operate need significant retrofitting, or need to be entirely rebuilt, in order to be able to provide the programs and services that clients have come to rely on. To ensure that urban Indigenous residents have safe and accessible spaces to access culturally-relevant services, Budget 2019 proposes to invest $60 million over five years, beginning in 2019–20, to support capital infrastructure investments in Friendship Centres, which deliver the majority of UPIP programming, as well as other urban Indigenous service provider facilities. First Nations communities face disproportionate health and safety risks arising from emergencies and natural disasters. The result is disruption, dislocation, and for too many people, a disconnection from the land that they call home. On average, people living on First Nations reserves in Canada are 18 times more likely to be evacuated as a result of disasters such as wildfires, floods and severe storms, compared to people living off-reserve. In the last year, Canada experienced the devastating effects of wildfires in British Columbia and Ontario, floods in the Saint John River Valley in New Brunswick, as well as tornadoes in the National Capital Region. With a changing climate, extreme weather events and the preconditions for wildfires are on the rise. Indigenous communities, 80 per cent of which are located in forested areas, are particularly vulnerable to the wildfires, which burn on average 2.3 million hectares of land per year across Canada. In the context of the 2018 British Columbia wildfires, First Nations experienced both the largest number of wildfire emergencies and the largest number of evacuations since data first became available in 2009. Federal support ranged from the Canadian Armed Forces providing air and ground assets for evacuations and assistance, to the Canadian Coast Guard making available aviation assets in support of the federal response. Parks Canada deployed an Incident Management Team for firefighting, as well as managing fire responses within national park sites. $211.0 million over five years, starting in 2019–20, with $49.4 million per year ongoing to support increased resiliency and emergency management on-reserve. $48.0 million over four years, starting in 2020–21, to renew funding for infrastructure projects on-reserve that will protect communities from climate-related hazards. These additional investments will strengthen the capacity of First Nations communities to prepare for and respond to emergencies, support activities to prevent and reduce the consequences of emergencies, and fund infrastructure projects such as dams and culverts to help decrease the need for emergency response and recovery on-reserve. They will also support the creation of an Indigenous Fire Marshall’s Office. This would be a First Nations-led institution that would promote fire safety and prevention, undertake public education, enforce local fire safety and building codes, and conduct regular building inspections in First Nations communities. Finally, as part of the Government’s efforts to strengthen emergency management across the country, Budget 2019 also proposes to invest in expanding the FireSmart program on-reserve. Members of First Nations communities who live on-reserve and have chronic illnesses or disabilities receive help through the Assisted Living Program, which provides daily living supports that help people maintain their independence and stay in their own homes and communities, close to their families and friends. This program helps over 10,000 people each year, on an income-tested basis, providing services that include in-home care, adult foster care and nursing home care. With a growing and aging client population, and greater demand for in-home care, Budget 2019 proposes to invest $35 million in 2019–20 to ensure the Assisted Living Program continues to help meet the needs of seniors and people with disabilities. To better support First Nations and Inuit individuals living with chronic illnesses and disabilities now and in the future, Budget 2019 also proposes to provide an additional $8.5 million over two years, starting in 2019–20, to work with First Nations and Inuit communities on developing a new and more holistic long-term care strategy. The Inuit Tapiriit Kanatami’s National Inuit Suicide Prevention Strategy was released in July 2016 and set out a series of actions and interventions at the community and regional level to address the high number of deaths by suicide among Inuit, where the suicide rate remains 5 to 25 times the national average for Canada. To continue to support Inuit peoples and communities, Budget 2019 proposes an investment of $50 million over 10 years, starting in 2019–20, with $5 million per year ongoing, to support ITK’s Inuit-specific approach through the Strategy to address deaths by suicide in Inuit communities. Nunavut has been without an addictions treatment centre for over 20 years. For too long, Inuit and other residents of Nunavut seeking mental health and substance use supports have had to travel south, far from their families, friends and communities to access the services that they need. The Truth and Reconciliation Commission of Canada called on the federal government to ensure funding for healing centres in Nunavut is a priority as part of Call to Action 21. As announced in Chapter 2, together with contributions from the Government of Nunavut and Inuit partners, the Government is committed to supporting the construction and ongoing operation of a treatment facility in Nunavut. The population of Indigenous Peoples in Canada is growing, and is increasingly younger than the general population. These younger generations of Indigenous Peoples are entrepreneurial and business-oriented, and increasingly recognize economic development as a means to self-reliance and greater autonomy for their communities and their people. At the same time, Indigenous Peoples are underrepresented in the labour market, compared to the general population in Canada. Ensuring that First Nations, Inuit and Métis are able to fully contribute to and share in Canada’s economic success is a critical part of advancing reconciliation and self-determination. To that end, Budget 2019 proposes to invest $78.9 million over five years, starting in 2019–20, with $15.8 million per year ongoing, to support Indigenous entrepreneurs and economic development. This investment, through the Community Opportunity Readiness Program, will help First Nations and Inuit communities build business plans, and provide funding to expand existing Indigenous-led businesses, and launch new Indigenous-led start-ups. The Métis Nation represents important Métis communities in Ontario, Manitoba, Saskatchewan, Alberta and British Columbia. Building on Budget 2016 investments to support the Métis Nation in developing an economic development strategy, Budget 2019 proposes to provide $50 million over five years, starting in 2019–20, to enhance the funding of the Métis Capital Corporations to support the start-up and expansion of Métis small and medium-sized enterprises. At present, there are 59 Aboriginal Financial Institutions across Canada providing financing to Indigenous entrepreneurs, helping them to start and grow successful businesses. This support not only helps individual businesses and their employees, it fosters greater economic self-reliance and lays the groundwork for growth that benefits Indigenous Peoples, and all Canadians. To further encourage investments in Indigenous-led businesses, Budget 2019 proposes to create an Indigenous Growth Fund. Managed by the National Aboriginal Capital Corporations Association, this Fund would allow all Aboriginal Financial Institutions, including Métis Capital Corporations and others, to support more Indigenous entrepreneurs, and more ambitious projects. The Government is proposing to provide up to $100 million, through the Social Finance Fund and the Business Development Bank of Canada, to support the Indigenous Growth Fund. Further details will be announced in the coming year, including the opportunity for participation by private sector investors. Further details of the Social Finance Fund can be found in Chapter 4. As announced in Chapter 2, Budget 2019 also proposes to provide Futurpreneur Canada, a national not-for-profit organization that helps youth entrepreneurs, $3 million over five years, starting in 2019–20, to allow the organization to increase its targeted support to the next generation of Indigenous entrepreneurs. Further details regarding support to Futurpreneur Canada can be found in Chapter 2. Rock-Tech, located just west of Sudbury in Lively, Ontario, provides products for the mining industry. With the financial support of the Métis Voyageur Development Fund, a Métis Capital Corporation, Rock-Tech was able to purchase and renovate its 32,000-square-foot manufacturing plant, and acquire the latest in manufacturing equipment, to help sustain and grow its business. With the additional capital, Rock-Tech was also able to improve plant safety and environmental and manufacturing competiveness, and won export contracts in South America. As a potential source of revenue, business development opportunities, and good, well-paying jobs for community members, major natural resource projects such as pipelines can offer significant benefits to Indigenous communities. Indigenous people are more likely to work in the natural resources sector than non-Indigenous persons. This can be a significant benefit as the natural resources sector’s average hourly wage is over $38, which is significantly higher than the national average of $27. Budget 2019 proposes to provide $12.8 million in 2019–20 to Natural Resources Canada to maintain its capacity to conduct meaningful consultations with Indigenous communities on major energy projects and to support Indigenous economic participation in the natural resource sectors. The Trans Mountain Expansion Project is an example of how the Government is consulting meaningfully with First Nations and Métis communities. Government officials, and representatives of Trans Mountain Corporation, have met with nearly all of the potentially impacted Indigenous communities along the route, and have heard important issues. Indigenous people are telling the Government that they want to protect sensitive sites, improve emergency response and safety capacity in their communities, protect the iconic southern resident killer whales and their habitat, mitigate the cumulative impacts of development on land and water, and ensure their communities have the opportunity to benefit economically from the project. The Government has provided federal consultation teams with a strong mandate to accommodate these concerns. The Government will make a decision on the Project once it is satisfied that the Crown has adequately fulfilled its duty to consult. Funding to forgive and reimburse all comprehensive claim negotiation loans, which will allow communities to reinvest in their priorities. $1.2 billion over three years to continue to implement Jordan’s Principle and help ensure that all First Nations children can access the health, social and educational services they need, when they need them. $327.5 million over five years to enhance the Post-Secondary Student Support Program while the Government engages with First Nations on long-term regional post-secondary education models. More than $1 billion over five years to improve essential services on-reserve, such as clean drinking water, fire protection, emergency response and supports for residents with disabilities or chronic illnesses. Support for a distinctions-based approach to Indigenous language revitalization projects with $333.7 million over five years to preserve, promote and revitalize Indigenous languages. $40.0 million over five years to help First Nations research and develop their specific claims and a commitment to renew and replenish funding for the Specific Claims Settlement Fund for a further three years. Support for strong and successful self-governing First Nations including investments to support a new co-developed collaborative self-government fiscal policy. A commitment to escalate funding for core programs and services provided through the 10-year grant to ensure that funding keeps up with key cost drivers effective April 2020. $50 million over 10 years to continue the important work of the National Inuit Suicide Prevention Strategy. $220 million over five years to provide important health and social services to Inuit children. Support for a distinctions-based approach to Indigenous language revitalization projects with $333.7 million over five years to preserve, promote and revitalize Indigenous languages, including Inuktitut and Inuvialuktun. Funding to forgive and reimburse all comprehensive claim loans, which will allow communities to reinvest in their priorities. Support for strong and successful Indigenous self-governments including investments to support a new co-developed collaborative self-government fiscal policy. $15 million, over five years to establish a Northern Isolated Community Initiatives Fund to support community-led food production projects and provide skills training for local and Indigenous food production systems. Together with contributions from the Government of Nunavut and Inuit partners, as part of the Budget 2019, the Government announces its commitment to support the construction and ongoing operation of a mental health and substance abuse treatment facility in Nunavut. $362 million over 10 years to support a Métis Nation-led post-secondary education strategy. $30 million to recognize the contribution of Métis veterans to the country’s Second World War efforts and to commemorate the sacrifices and achievements of all Métis veterans. Support for a distinctions-based approach to Indigenous language revitalization projects with $333.7 million over five years to preserve, promote and revitalize Indigenous languages, including Michif, the traditional language spoken by Métis Peoples. $50 million over five years to enhance the funding of the Métis Capital Corporations to support the start-up and expansion of Métis small and medium-sized enterprises, and up to $100 million to establish an Indigenous Growth Fund to further encourage investments in Indigenous-led businesses by Aboriginal Financial Institutions, including Métis Capital Corporations.